Heat oven to 375°F. In medium microwavable bowl, place polenta and water. Microwave uncovered on High 30 to 60 seconds or until soft enough to mash. Mash with fork until mixture looks like coarse crumbs. Separate dough into 8 biscuits. Press or roll each to form 5-inch round. Spoon and press 2 tablespoons polenta mixture onto each round to within 1/2 inch of edge. Sprinkle each with 2 teaspoons chopped chiles. 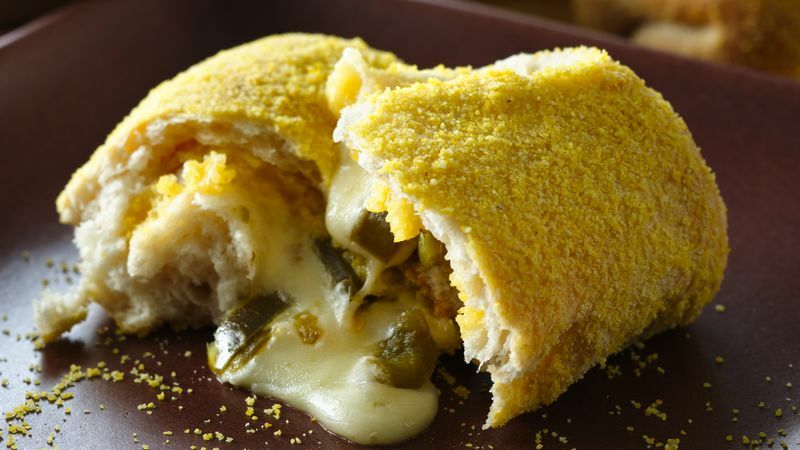 Place 1 strip cheese on each round; fold dough over cheese strip, folding in sides and pinching dough well to seal. In shallow dish, place cornmeal. Lightly spray each tamale with cooking spray; coat with cornmeal. Place on ungreased cookie sheet. Bake about 15 minutes or until light golden brown. Let stand 5 minutes before serving. Serve with salsa verde, sour cream or chopped fresh cilantro. Be sure to seal dough well to prevent cheese from melting out during baking.